As consumers become more sophisticated and demand more convenient packaging with higher graphic and visual appeal, packaged consumer goods manufacturers diversify into brands and brand line extensions. Shrink sleeve labels offer packaging technologists, designers, and brand managers high quality aesthetics supporting brand image and recognition. Provide greatest area for additional information – nutritional, use, contents, safety, etc. Wide range of special effects - matt, gloss, thermo chromic, metallic, pearlescent, fluorescent, etc. 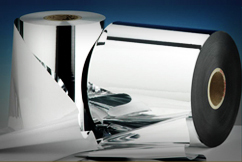 The Ester shrink film offers high shrink rate, making it useful against most of the contoured surfaces. The product also offers excellent slip properties, antistatic characteristic, clarity, and gloss making highly suitable for reverse printing. It is noteworthy that this product, (unlike PVC Shrink sleeves), is free from chlorine contamination, and is thus being increasingly preferred by environment conscious stakeholders (FMCG's and laminators) and markets. This film is available in a thickness range of 40-50 microns. This film conforms to EC directives, REACH specifications and US FDA regulations for food contact application. Offers high transverse and low machine direction shrinkage at low temperature. Possess better shrink initiation temperature for ease of storage and transportation condition after converting. Suitable for use in Beverages, Wine, Spirits, Food, Personal Care, Cosmetic, Household Cleaning and Dairy etc.